Race and Battle Your Friends in the Definitive Version of Mario Kart 8! Hit the road with the definitive version of Mario Kart™ 8 and play anytime, anywhere! Race your friends or battle them in a revised battle mode on new and returning battle courses. Play locally in up to 4-player multiplayer in 1080p while playing in TV Mode. Every track from the Wii U™ version, including DLC, makes a glorious return. Plus, the Inklings appear as all-new guest characters, along with returning favorites, such as King Boo™, Dry Bones, and Bowser™ Jr.! Add to the fun with a Joy-Con™ Wheel (available separately)! 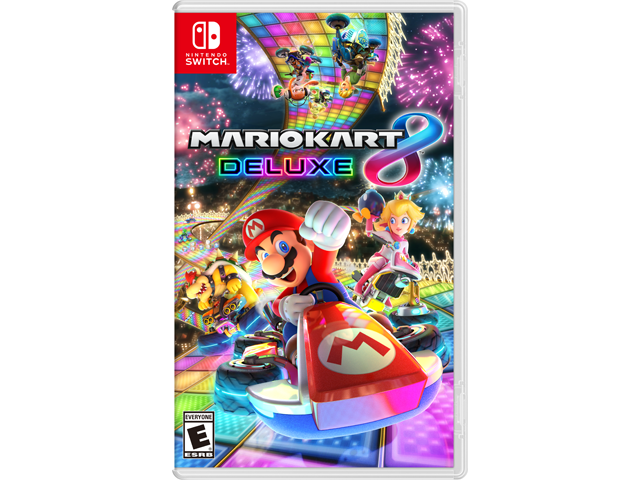 Race your friends in the definitive version of Mario Kart 8, only on Nintendo Switch™! Battle on new courses, like Urchin Underpass and Battle Stadium, or returning ones, such as GCN™ Luigi's Mansion™ and SNES™ Battle Course 1. Inkling Girl & Inkling Boy from Splatoon™, King Boo, Dry Bones, and Bowser Jr. join the roster!